The Craigslist casting, Ashton Kutcher glorifying, budget lacking Steve Jobs biopic just added some fresh blood: the guy from Full Metal Jacket will join the funny fat man from Book of Mormon. Uh, alright! jOBS—yes, that's really the title of a movie that will be made—will star Matthew "Private Joker" Modine (far left) and Mormon's Josh Gad (far right) as Pepsi CEO Villain John Sculley and The Woz, respectively. This is good news, as both gents are fine actors, but there is the slight problem of neither of them looking much of anything like their characters. 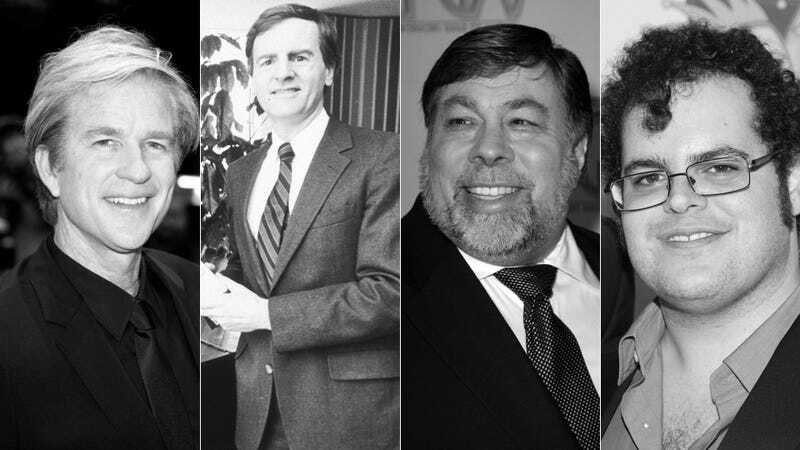 This is fine in the case of Sculley, since nobody knows what he looks like anyway, but Wozniak is a human icon. It's hard to imagine anyone but a spitting image portraying Woz, but it's also hard to imagine anyone going to see this movie, so let's just wait for Aaron Sorkin's version to be good and rack up some Oscar nominations, and let Kutcher's locks blow in the wind as he forgets his lines. "It's my feeling — and I think there's a lot of people who feel — that had John Sculley not fired Steve Jobs from Apple Computers and Steve go on the journey that he did when he was away from Apple Computers that we wouldn't be speaking about Steve Jobs today."